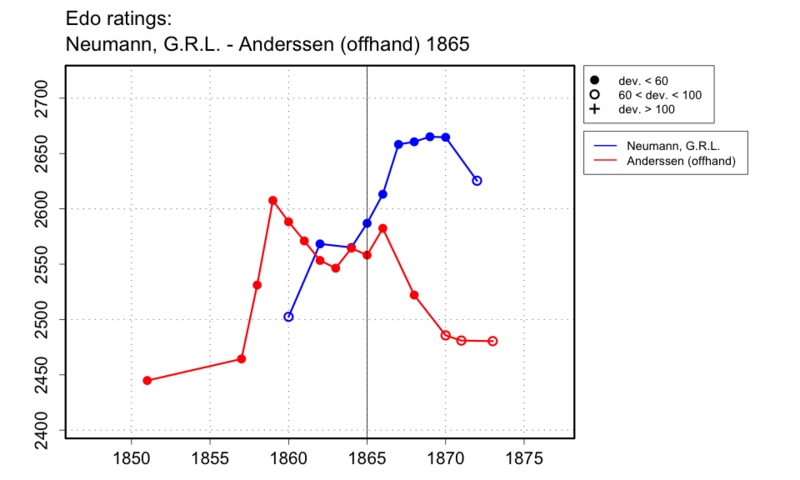 Le Sphinx of 15 June 1865 (p.76) says that Neumann had won a few games more than Anderssen over about 100 played. Di Felice gives a match result of +14-11=3 for Neumann. Renette and Zavatarelli (p.215) say that Neumann won about half the games they played during Anderssen's April visit to Berlin, and make no mention of a formal match. I will record a soft result of 52-48 for Neumann. I use the dates of Anderssen's stay in Berlin.